Germany, Koln. Philipp von Heinsberg, AD 1167 to 1191. Silver denier. Denomination : Silver Denier. Mint : Koln. 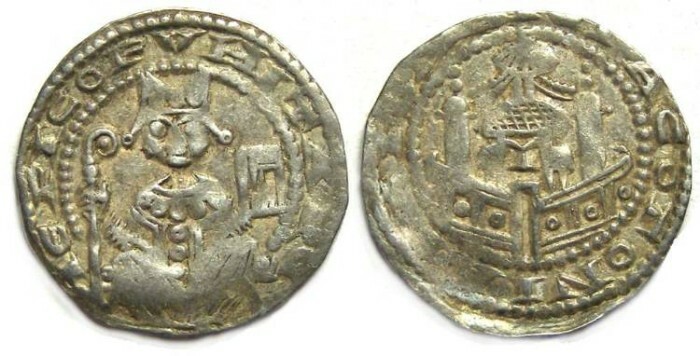 Date : Probably struck between AD 1167 and 1175. Size : 17.9 x 18.3 mm. Weight : 1.50 grams. Reference : Hav - 541. Grade : VF, with a nearly complete obverse inscriptions (unusual for these). Obverse : Bishop seated forward, holding a crook and a book, with EPI COFVHIT ARC around. Reverse : Church enclosed by a city wall, with EA COGONIA CMAI (or similar) around. Interesting how the L is upside down in COLONIA. The inscriptions I have listed above are probably not exact, but are as close as I can work them out based on what I see on this coin, and on other specimens I have been able to locate.